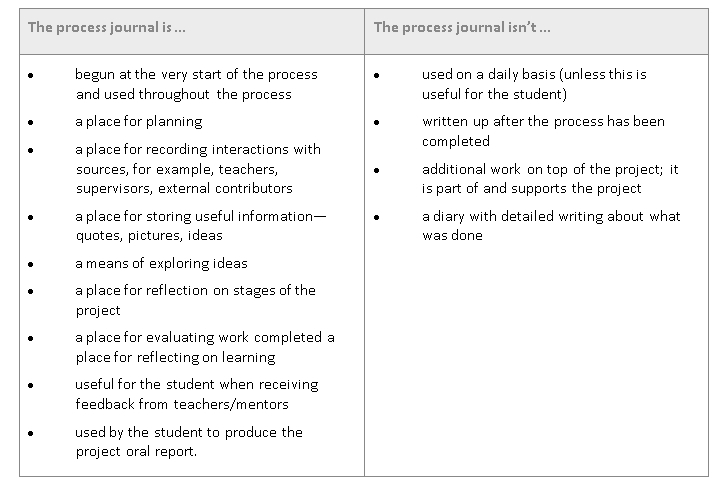 The process journal is a required assessed part of your Personal Project. It will also be very helpful to you - helping you track your successes and frustrations, serving as a place to remind you of what you still need to accomplish, and of what you did well and where you had missteps when it's time to complete your reflection. You can include all types of information in your Process Journal - it can be used to record your progress, thoughts, ideas, decisions, feelings and reflections as you work on your project. You should update it often, as this is what your teacher will use to determine your progress and to help you. The information you record in your process journal will also help in the organization of your oral presentation. This year, all students will maintain a Process Journal on their own Weebly for Education website! Your teacher will provide you with this account and instruction on how to create it. These webpages are an exciting way for you to not only record and manage your Process Journal, but to also save and showcase research, resources, photos and other artifacts of your project. Project documents that you are assigned by your teacher will also be uploaded to your Weebly website. You may even be able to incorporate your website into your final oral presentation!